Home Full Forms List What is the full form of MNC? What is the full form of MNC? Do you Know what is full form of MNC? 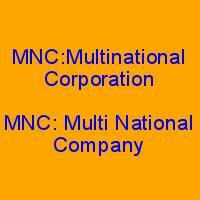 The abbreviation MNC stands for Multinational Corporation. As the name clearly signifies that this refers to the kind of company or organization which holds it’s presence in more than one country. This kind of multinational companies has a wide range of production, playing a crucial role in significant sectors like employment, economic growth, and goods export. The key factor behind the success of multinationals is their marketing strategy and innovation in service and the products they deliver. Worldwide functioning is controlled by a single parental company located in the home country. Land availability: Land is the primary necessity for establishing the initial setup for factory unit. Land availability in the budget is a major component for setting up any company in any location. Labor: Multinational companies need cheap labor for industrial work. A country where the population is high, these companies are the source of high employability. In a country like India, these companies help in increasing employment opportunities. These tend to contribute to increasing the economic status of the society and help in the evolution of the society as a whole. Although these multinational companies provide labor and employment, the work is rigorous and employment laws are not up to the mark. There is no job security and long working hours. Raw material: Often it is more profitable and preferable to set up the company near to the raw material sources. It has two benefits. Firstly it helps in reducing the transport cost and secondary it reduces the preservation techniques needed to keep the raw materials fresh and usable. Investors/ Capital: There are many sources which contribute to the funds of these companies. Few major sources include public grant subsidies, selling the debt products, private forums like banks and insurance companies. Government laws: Every country has certain laws which regulate the establishment of multinational companies. These laws guide functioning and usage of the country’s resources. These laws are different in every country, if the company abides by the law or if it can function within the law then only it is allowed to establish in any country. All major multinational Giants represent a very good MNC job scenario, but although these are very fascinating for upper positions it’s not the same for lower posts of industry workers. Labor exploitation is a very prominent issue in big multinational companies. Women employment laws need amendments, to increase women employability in the corporate sector. As a matter of fact, these contribute significantly to the economic growth, boosting the employment ratio, but as it’s always said: “there is a room for improvement!”. Also read What is the full form of IFFCO? Previous articleWhat is full form of ABO?